Want lotion to go in your bread? 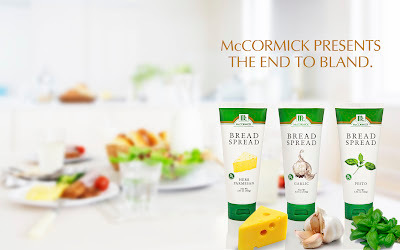 Well literally at first glance when I saw McCormick Bread Spread, it can easily be confused for a lotion. 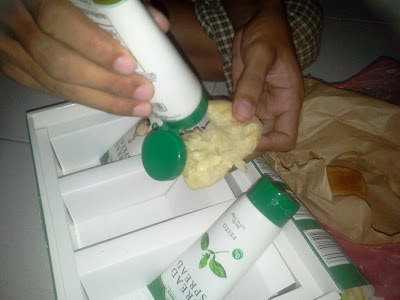 We have never tasted something like this before and I have my kids to eat with me pandesal plus McCormick Bread Spread. There were 3 flavors, Garlic, Herb Parmesan and Pesto. Among the three flavors, my kids do like Pesto and Garlic, the least liked was Herb Parmesan. Well perhaps for kids the cheese was not in for their taste buds. Personally, I like them all yet again Pesto still comes on top. What's great about McCormick Bread Spread is that you can easily squeeze them out of the lotion type containers. So it is ideal for any kind of flavoring. You can use them for the usual spread or even for dips on chips or spread it on a biscuit or I think it can also be used for cake flavoring. McCormick Bread Spread was introduced last July to bloggers during an event called “Goodbye Bland, Hello Flavorful!” The highlight of the event was when Celebrity Chef Stephanie Zubiri demonstrated the amazing flavor and true versatility of the line by concocting three dishes using McCormick Bread Spreads. CHef Zubiri prepared a Pesto Orange Balsamic Salad Dressing, Garlic Herb Lemon Zest Carbonara, and Grilled Stuffed Chicken Breast with Roasted Veggie Millefeuille.